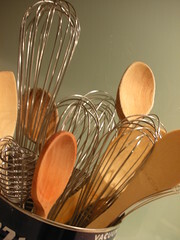 I’m Stephanie, and as you can see, I actually have many whisks and spoons. They reside in a tin on my kitchen counter in Brooklyn, New York. You have a fabulous blog & your pictures are superb! I love your blog and your pictures are amazing. I love photographing my food but yours honestly looks right out of Everyday Food. I’m jealous ha ha! I would love to know what you shoot with and your thoughts on food photogrpahy in general. Danielle–Thanks for the comment! I think I’m such an amateur with the camera (I could point out a few really talented bloggers)! I just use a point-and-shoot digital…a Nikon Coolpix S6. I take my food photos with no flash (just good sunlight, ideally) and using the close-up function. I’d love a full-on camera with lenses, etc, and maybe take a few classes to figure out how to use them! When I first started this blog, I was very self-conscious of my pictures, but now photographing my food is something that I really love doing (even if hubby thinks I’m nuts). I think food can be so stunning, and I love choosing angles and backgounds, props, etc. You have an amazing gift for photography. Thanks for sharing it. Laurie–I will send you an e-mail! Just want to say I like your style! Great photos. too I made cupcakes just like yours a few weeks back and was so excited to see you do the same thing. I also dedicated them to my memories of east coast summer soft serve. We called it the “swirl “cone in New England. Love love love your photos. It’s time for bed and your pictures have inspired me so much I want to start baking. What made you move to Sydney? I absolutely love your food photography…very professional! Great blog Stephanie and I’m sure there are some folks over here who would happily send you PB for your stash…. Good day over there. hey steph, absolutely adore your pics + posts! just HAD to give you a shoutout. will be back for more *beams* i haven’t had my chocolate fix yet, but I’m on the hunt. lol. We moved back to New York City about a year ago…I need to change this page, I know. I hope we can one day! Hi Steph, I am another fan from Australia! I have bookmarked a number of recipes that I can’t wait to try. I wanted to say THANK YOU!! For your inspiration and your fabulous recipes!! Thanks, Anita! I use a Nikon Coolpix. It’s just a point-and-shoot, and it’s a few years old now, so I hope to upgrade someday soon! Ok, so its not the camera, its YOU. Amazing stuff. Do you have a twitter? I found your blog through a google search for “Beet Recipes” and I totally love it. I’m currently focusing recipes involving Beets over at my blog – do you mind if I link to you when I post this Sunday? I’d also want to link to your blog permanently on my blog roll if that’s okay. Hi, Sarafae! I don’t mind at all. Thanks for the nice comments! I’m so glad I stumbled upon your blog! I spent the last 3-4 hours poring over your blog and finally got to the very first post! 🙂 Yes, they keep the eggs at room temperature here in Australia but back home in Malaysia, we store them both ways. No idea what this means. Looks great!!!! gosh now im hungry for ice cream and goodies! Yum, yum, yum! I can’t wait to try out making your bittersweet chocolate brownies! Excellent blog and love the photos and the recipes you site! Thanks much! Hi Steph, I love love love your blog. Your recipes and photos are fantastic. Great blog. Makes me want to learn how to actually bake. It’s a work in progress in my kitchen. Also, on my scale. I just know that if I made a dozen cupcakes, I’d eat a dozen cupcakes the next day. You have a beautiful blog. I saw on your responses that you use a point and shoot. You have a really good eye and your pictures look great. How long have you been blogging? I’ve been blogging for almost a year and I’ve used a Canon point and shoot the entire time. It has been challenging, but I’ve learned a lot about light. I didn’t realize someone already had, so I have nominated your blog for the Versatile Blogger Award. In any case, I posted a link to you! Hey Stephanie, I have just been poking around your blog and I love it! Looking forward to stopping by again! Hello – I have just nominated you for the Liebster Award. See my link to learn all about it. http://www.traveltalesandstuff.com/liebster-award-nominee. Thank you sharing your blog posts. awesome blog! Great pictures! I’ll be back having fun poking around! I nominated you for the Beautiful Blogger Award! Hello! i just see you blog and is lovely! Hello Stephanie! I’ve decided to read and follow 15 interesting and new blogs a day every day for the first month of 2015, and yours is today’s #15! Feel free to come visit me when you can at http://www.thatssojacob.wordpress.com, and follow if you like what you read. Happy new year and happy blogging! Hi Stephanie, you have a beautiful and inspiring blog! Hiya, I have nominated you for the Creative Blog Award – it’s a bit of fun. Keep it going. Your cakes look so decadent! beautiful blog posts and wonderful recipes! thanks for sharing, Stephanie! Hey! I really enjoyed reading your blog, so I’ve nominated you for the Blogger Recognition Award. For some this award nomination procedure maybe like sending chain letters like we did in elementary. You can simply ignore this post and decline it or you can embrace it as an opportunity to get in touch, maybe build a community and show fellow bloggers you like what they are doing. Do you actually bake without electric mixers using those spoons and whisks? I do! Hi Lorraine. I’m not gluten-free so I’ve never baked it that way. If you have a reliable GF flour that you’re used to using, I’d give it a go. Sorry I can’t be more help!